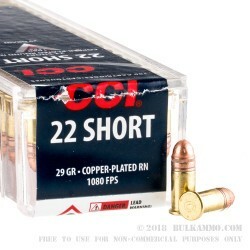 CCI is a well known name in the firearms industry. CCI ammunition is manufactured in the United States and is made locally in Idaho, they use some of the highest quality material in their production process to ensure quality results every time that you pull the trigger. 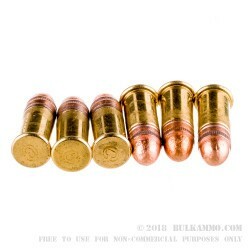 The bullets are 29 grain and they have a copper plated round nose. 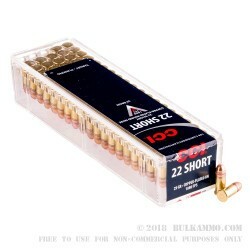 The copper plating helps the bullet to chamber easier than other lead ammo, plus it helps to cut down on fouling, so you will not have to clean your rifle as often or worry about long term damages. This bullet also has a fatter midsection, which helps to give it better spin stabilization when going through the barrel which helps to improve the accuracy of this round. Its muzzle velocity is 1080 feet per second, and it has a rimfire primed brass casing. 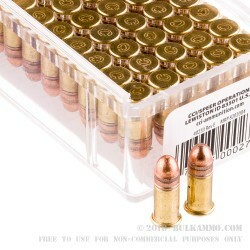 This bulk package has 5000 rounds per case and 100 rounds per box. This way you can shoot all day at the range and not have to worry about running out of ammo.